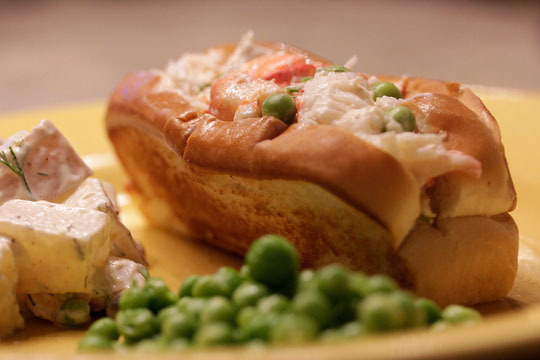 It’s hard to improve upon the classic lobster roll. Whether you fall into the butter or mayo camp, the basic principle is simplicity: pillowy white-bread bun, slathered in butter and toasted on the griddle, stuffed to bursting with lobster, oil/dressing of choice, and maybe a squeeze of lemon. Done. This Fourth of July, inspired by the abundant fresh herbs in the garden and the haul of peas we brought home from the U-pick farm down the road (an afterthought when we’d finished our annual July 4th strawberry picking), we got a little crazy. To our lobster and mayonnaise, we added a few handfuls of freshly shelled raw peas, a scattering of chopped cilantro, and the juice of a lime. No change to the bun. The resulting roll had pockets of crunch and an overall sweetness that was balanced by the freshness of the cilantro. Delicious.